The Kansas City Fed has reported that the rate of residential construction has been contributing to the tight supply of existing homes listed for sale. New construction provides liquidity to local housing markets, where households are often both buyers and sellers. With fewer new homes from which to choose, many homeowners considering upgrading have instead chosen to remain in their current homes and so have not listed them for sale. As a result, the number of existing homes for sale has decreased as well, dissuading other homeowners from upgrading and further dampening sales listings. This “vicious circle” has limited the efficacy of rising sales prices in eliciting more listings. 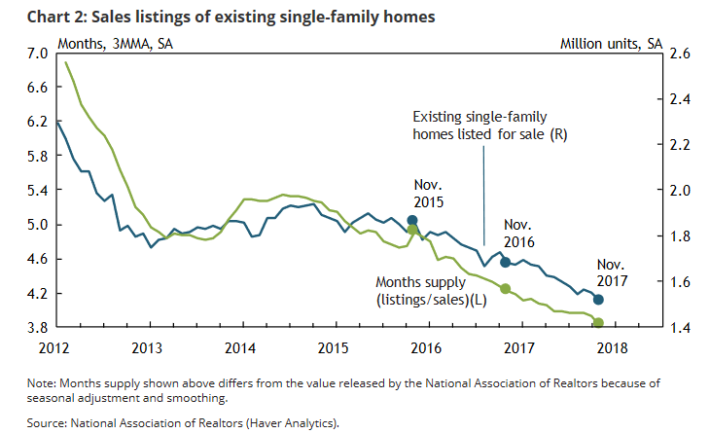 Since early 2015, the number of single-family homes listed for sale has steadily declined. Correspondingly, the ratio of listed homes to monthly sales, also known as “months supply,” fell to 3.8 in November, its lowest value since 1982, the earliest date for which data are available. Two of the key reasons inventory is low: 1) A large number of single family home and condos were converted to rental units. In 2015, it is estimated there were 17.5 million renter occupied single family homes in the U.S., up from 10.7 million in 2000. Many of these houses were purchased by investors, and rents have increased substantially, and the investors are not selling (even though prices have increased too). Most of these rental conversions were at the lower end, and that is limiting the supply for first time buyers. 2) Baby boomers are aging in place (people tend to downsize when they are 75 or 80, in another 10 to 20 years for the boomers). Instead, we have seen a surge in home improvement spending, and this is also limiting supply.